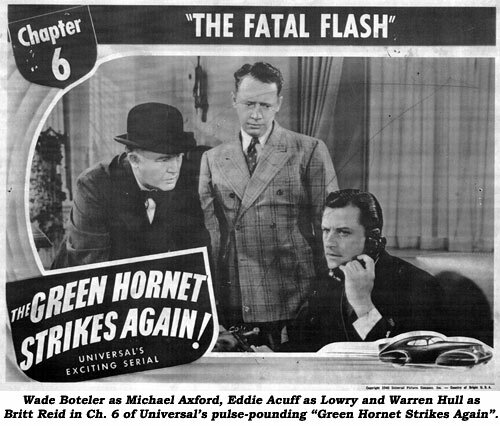 Serial Report Chapter 31-"The Green Hornet Strikes Again", Universal serials, Bruce Edwards. Today, when heroes from an earlier media era are dusted off and given a new coat of paint for celluloid rebirth, the makers of these films are not immune from the temptation of re-inventing certain aspects of the original characters. There was, as an example, an attempt, thankfully aborted, following Christopher Reeves’ exit from the Superman franchise, to totally re-design the look and history of the Man of Steel including a complete altering of his classic uniform. Fortunately, saner heads prevailed and the world’s most famous superhero emerged, more or less, in his traditional garb. Saner heads, however, were not always present during the golden days of movie serials when studio honchos often went to comic book vaults for their inspiration and cliffhanger sources and decided to play around, sometimes drastically, with the characters. Prime examples of this would be the mauling of Jack Kirby’s “Captain America” (‘44 Republic) and even more infamous, the altering of the story of “The Lone Ranger” (‘38 Republic). The latter so infuriated Ranger co-creator (with Fran Striker) George Trendle that he vowed not to deal with film adaptations of his most famous creation again, a promise he kept for many years until the production of the Clayton Moore television series which he carefully monitored. 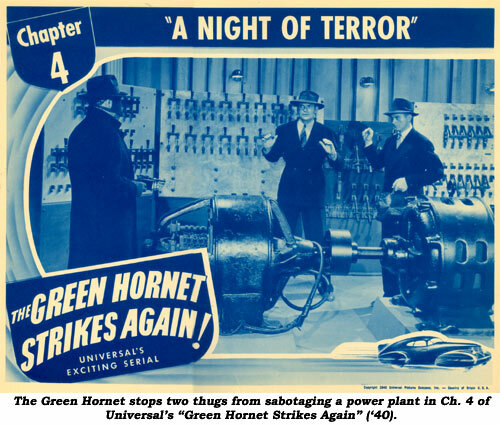 However, there were no such problems—not significant ones anyway—when Universal adapted Trendle’s other radio character, the Green Hornet, into a serial hero for a pair of cliffhangers produced in 1940. The first of these, “The Green Hornet”, was more or less faithful to the radio version with the masked do-gooder and his assistant Kato out to discover the identity of the master criminal behind a series of crimes. 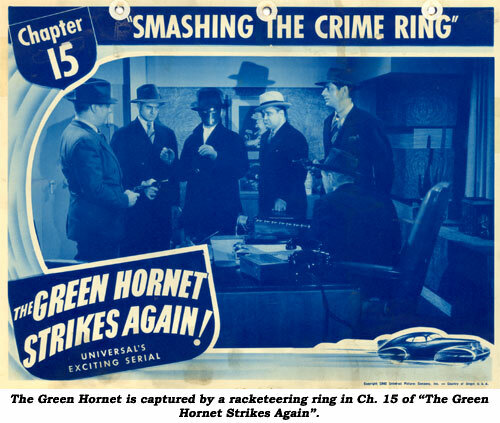 The second serial, “The Green Hornet Strikes Again”, plowed similar ground with the 15 chapters being constructed with the Hornet moving from unraveling and preventing one series of seemingly unrelated crimes after another until the conclusion when the brains behind the whole racketeering operation is exposed and brought to justice. Much of the cast from the first serial returned for the second outing. The big change came in the replacement of the original screen Hornet, Gordon Jones, with Warren Hull, the latter having already appeared effectively as the lead in two earlier cliffhangers, “Mandrake the Magician”(‘39 Columbia) and “The Spider Returns” (‘41 Columbia). Jones, who later in his career gained both weight and a reputation for low-brow comedy, had played Britt Reid in a somewhat relaxed and even irreverent manner, a nice change in fact, from the usually deadly-earnest portrayal of most granite-jawed serial heroes. Warren Hull’s Reid was more or less of the latter description, likable though more often than not somber and deadly serious. But with Hull this seemed okay. Unlike the first serial where the Hornet’s voice was dubbed by Al Hodge, who starred in the radio version, Hull’s own pre-recorded voice emerged from the masked character’s lips. Returning for “...Strikes Again” are Keye Luke as the Hornet’s loyal assistant Kato, Anne Nagel as Lenore Case and Wade Boteler, slightly overdoing the Irish brogue, as Michael Axford, both members of the SENTINEL newspaper staff. 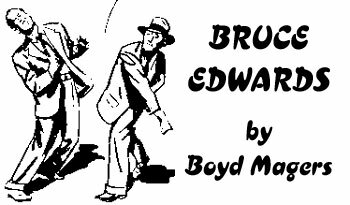 Other cast members include the likable Eddie Acuff as newshound Lowry, Pierre Watkin as the criminal mastermind Grogan, James Seay, William Forrest, William Hall, Dorothy Lovett, Jay Michael and Montague Shaw. 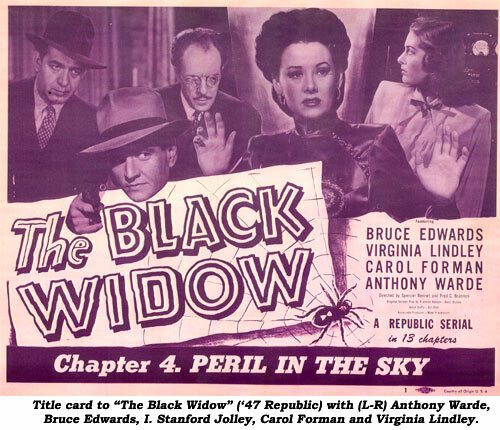 Jean Brooks, later a member of RKO producer Val Lewton’s stable of performers in his classic horror films, is also briefly seen in the opening moments as a female friend of the vacationing Reid. 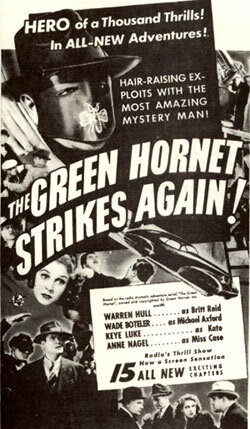 “The Green Hornet Strikes Again”, penned by the collaborative team of George Pympton, Basil Dickey and Sherman Lowe, is structured much like the first serial, in that working their way up a ladder of seemingly unrelated schemes and unlawful acts Kato and the Hornet finally arrive at the connecting tissue of the underworld empire behind all of these activities. The pace is pretty relentless with a myriad of gun battles (with the Hornet employing his trademark gas pistol to good effect), fist fights (clumsily choreographed as were most non-Republic serial brawls) and car chases. One criticism of this otherwise above average serial is that too often stock footage from Universal’s film vaults, as well as action moments excised from the first Hornet serial only made a year before, are included. In addition, the Hornet tends to escape from the cliffhanger challenges simply by weathering without a scratch the various explosions and attacks upon him, but that’s fairly par for Universal chapterplays. Interestingly, most of the serial’s music is lifted from Universal’s first Mummy film featuring Kharis, “The Mummy’s Hand”, attributed piecemeal—though not in the credits—to studio composers Hans Salter, Charles Previn and Frank Skinner and which would continue to be recycled throughout the entire Mummy series. 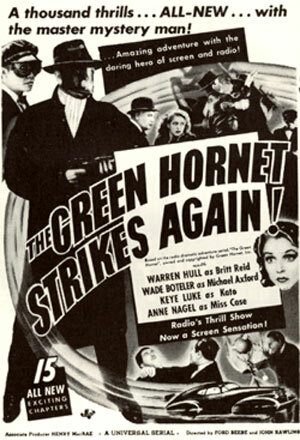 On the whole “The Green Hornet Strikes Again” is an entertaining and impressively paced production with solid direction by Ford Beebe and John Rawlings. There would, however, be no further cliffhangers featuring the character. Although The Hornet continued to be popular with radio fans for many years, he did not return to the screen until his debut on television in the ‘60s. The script girl had a day off in Ch. 2 of “Mystery Mountain”. Ken Maynard has guns, then empty holsters, yet he fires at a badman. Then back to empty holsters, but arriving at camp he once again has a pair of sixguns. The years 1920-‘23 were serial standouts for Universal, locked in a dead-heat battle for serial supremacy with Pathé. Each studio was producing about five serials a year. 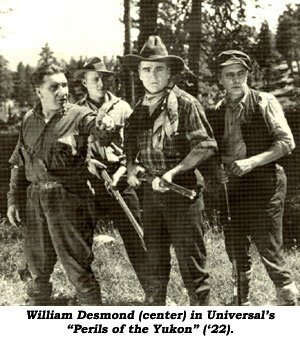 A sample of Universal’s output during those years follows, as found in issues of UNIVERSAL WEEKLY. 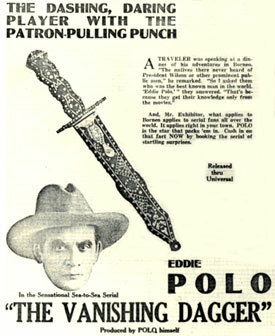 In 1920 Eddie Polo was Universal’s King of Serials. He’d been a circus acrobat who got into films in 1913 as a stuntman and whose natural athletic ability made him a star of adventure films featuring Doug Fairbanks-type gymnastics. In 1915 he became the first man to parachute from the Eiffel Tower, which was the same year he appeared in his first serial, “Broken Coin”. Universal billed him as the ‘Hercules of the Screen.’ Earlier in 1920 he’d appeared in the “Vanishing Dagger” chapterplay. Now he was being promoted in “King of the Circus”, 18 episodes: “See Eddie suspended by his fingers, high above the streets.” “What’s that? The villains are pushing Eddie to certain death.” In 1921 Eddie appeared in “Do or Die”, “18 desperate adventures with pirates, black witches, mystery, Cuba, fights, hidden treasure, submarines, Morro Castle, thrills, mystery women, moats, high dives, dungeons and wild rides.” Directed by J. P. McGowan, who gave himself two acting parts. In 1922 Polo appeared in “The Secret Four”. 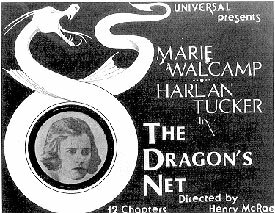 In 1920 Universal was “Introducing Eileen Sedgwick, the new queen of the serials. 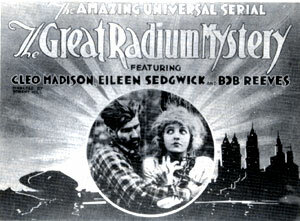 Now starring in ‘The Great Radium Mystery’ and coming soon in ‘Diamond Queen’, the wildest and most fascinating serial ever filmed,” the latter directed by Edward Kull. (Kull later became a cinematographer, shooting “King of the Wild” ‘31, “Mystery Trooper” ‘31, “Young Eagles” ‘34 and “New Adventures of Tarzan” ‘35.) The next year Sedgwick was in “Terror Trail”, “a secret service adventure serial,” also directed by Kull. 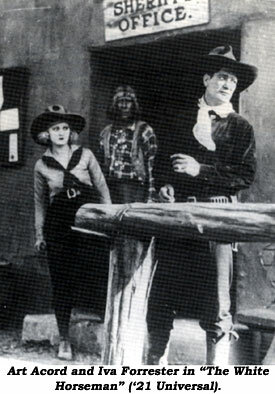 Another of Universal’s popular serial heroes was cowboy Art Acord, who starred in “The Moon Riders” in 1920, directed by Edward Kull, and “White Horseman” in ‘21. Ads for the latter, which was directed by Al Russell, show Acord and two of the characters, The Mummy Man (“the strangest and most mysterious character known to filmdom”) who is pictured as an ancient mummy, and The Spider Man, a hooded character with a spider emblazoned on the hood. Intriguingly, FILM DAILY YEAR BOOK for ‘29 (and all subsequent editions) says “White Horseman” starred Eddie Polo and was directed by J. P. McGowan. The filmography I have for Polo, from WHO WAS WHO ON SCREEN, lists “White Horseman”, but so does the filmography for Acord. None of the promo-tional and graphic material released at the time by Universal mentions Eddie Polo or J.P. McGowan. I suspect an historical error by MOTION PICTURE DAILY at the time that’s been perpetuated in record books ever since. The next year (‘22) Acord appeared in “Winners of the West” and “In the Days of Buffalo Bill”, both directed by Edward Laemmle. 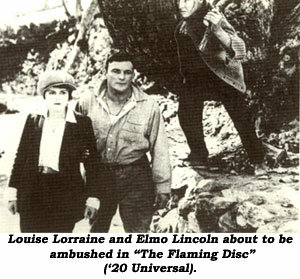 Then there was “Elmo Lincoln in his latest and speediest serial ‘The Flaming Disc’ (‘20), an 18-episode sensation with a choke and clutch thrill in every one of its action-full scenes.” Directed by Robert Hill. Lincoln, as you well know, was still appearing in movies in the ‘50s. Friday; “With Stanley in Africa” (‘22) with George Walsh and Louise Lorraine; “Perils of the Yukon” (‘22) with William Farnum; “Radio King” (‘22) with Roy Stewart and Louise Lorraine and “Around the World in 18 Days” (‘22) with William Farnum. I wonder how many of these serials still survive in some lonely vault? Sentenced to death, native bowmen prepare to fire their arrows at a bound Don McGuire and Jack Ingram at the Ch. 9 cliffhanger of “Congo Bill”. Native leader Frank Lackteen strikes a huge gong as a signal for the bowmen to let their arrows fly but, at the beginning of Ch. 10, the sacrifice is disrupted by Congo Bill’s native friend Neyle Morrow. Lackteen never strikes the sacrificial gong. Edwards died at 90 September 20, 2002, in Thousand Oaks, CA.